Editor’s Letter With the release of Whim’s first ever digital magazine issue, it only seems fitting to go back to how it all began. It was a rainy Saturday evening and I was sitting inside my study feeling bored. The solution to my boredom? I created a blog. What began as a creative outlet soon turned into so much more. Within weeks I was receiving emails from photographers, artists and bloggers complimenting Whim and offering to be featured on the site. 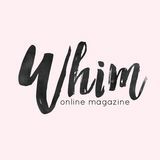 I’ve been blown away with the amount of talent wishing to collaborate with Whim, as well as the readership and kind words Whim has received in such a short period of time. When I began Whim Online Magazine, it was always my wish to one day turn it into an actual online magazine; one you can digitally flip the pages of and find endless sources of inspiration crammed onto every page. As Whim turned three months old this month, I am so pleased to have already reached this first goal. Thank you so much to everyone who reads Whim, has collaborated with Whim, and who has contributed to this issue. This is only the beginning, and I am so excited for what the future holds for this humble publication with very big dreams. Hope you enjoy the issue! “I am a humble photographer based in Brisbane, Australia; I am obsessed with magazines, flowers, and houses… Often working in nature with the sun as my guide, in both digital and film formats, my photographs always speak a little more gently than most.” – Lost In Wishful Thinking If you could only describe yourself in three words, what would they be? Happy, Creative, Dreamer. Where is your hometown? What do you like most about it? I have lived and still live in Brisbane, Australia. I love that I have so many memories here, and although we aren't the 'hippest' place in Australia, we do have some cool things going on and an awesome choice of beaches! Who, or what, are you inspired by the most? Nature! My surroundings while I am shooting has a large influence on me. What concepts or emotions do you wish to portray through your photography? I would like to think my photographs convey the sense of being 'lost in wishful thinking'. Some shoots convey this more than others. I think my shoots just often play on the notions of being in another world that is familiar but also not your every day thing.. If that makes sense! Do you have a particular photoshoot that has been your favourite so far? My most recent shoot is usually my most favourite, so it is ever changing :) What do you like to do in your spare time? Alongside photography, my other big love in life is my boyfriend and we hang out as much as we can. If I am not with him or working on photography I will be reading blogs and magazines, picking flowers from the garden, drinking tea and baking. What has been the best piece of photography advice you have ever heard? The gear does not make you a good photographer (though it can help), it is what you do with what you have that counts. When it comes to the future of your photography, what do you hope to achieve? Right now when I get asked this question I am telling people that I am photographing for Country Style Magazine! But really I would just love to be working alongside like-minded people in the creative industries making magic and having fun - getting it printed in a magazine or book would just be a bonus! Read new books: If you’re stuck inside because it’s raining or too cold outside, books allow your mind to escape the confines of a drizzly day. If you’re in need of a new book to read, you can get some ideas by having a look at our Reading List on page 57. Drink plenty of healthy, herbal tea: Herbal tea will instantly warm you and lift your mood and the added bonus of herbal teas, such as green tea or honey and ginger, is that they will also provide your body with the nutrients it needs to keep sickness and flu away. Learn to knit: When you hear the word ‘knitting’, your mind probably conjures images of grandmas sitting in rocking chairs. Don’t let stereotypes stop you! Winter is all about scarves and woollen jumpers, so what could be better than making your own? Catch up on a television show or watch a movie you’ve always wanted to see: Grab a blanket and a cup of tea and spend some time relaxing in front of the television without the guilt of wasting a beautifully sunny day outside. Try your hand at art and craft: Keep your mind active and fight winter boredom by beginning a new craft or DIY project, or by trying your hand at drawing or painting. There’s plenty of great DIY and craft projects on websites such as Pinterest, and the bonus is that you’ll be left with something to admire or use. Remember, practice makes perfect, so even if you don’t consider yourself a budding artist, then you will certainly get better with each drawing or painting you attempt. Makeover your space: If there’s ever a perfect time to want to give your bedroom or study space a makeover, then winter is perfect. It is during the cold season that you spend the most amount of time indoors, so why not turn your favourite spaces in your home into rooms that will constantly inspire you? Dust off your favourite board games: It seems as though board games are seldom played once we reach adulthood, but this shouldn’t be the case! Board games are a great way to interact with friends and family and to embrace your competitive spirit. It’s all about having plenty of fun and reminiscing over the games you once loved as a child. Opt for a new hairstyle: You might not think so, but sometimes a new haircut or colour is all you need to lift your spirits and get you feeling inspired again. After all, they say change is as good as a holiday! We love Paige Joanna’s gorgeous shade of red (See page 33) and are also inspired by fuss-free, midlength tresses that perfectly frame the face. talking about how we are all just Russians looking at Alaska through a telescope. I made an indestructible greenhouse in her sternum so she could harbour ships of ideas inside her. that determines who she is on a winter’s night when they've left her bed. “I am a small girl with rather large dreams. I am an Illustrator from the south of England, living and loving being creative. Most of the time I live in my own little world and it contains a lot of tea drinking and buying silly things.” – Paige Joanna Blog How would you describe yourself in just three words? Playful, creative, emotional. When did you first begin your style blog, and why? About a year and a half ago now, I started it because at the time I was getting bored with my second year of university, I was growing in popularity on Lookbook and kind of wanted another creative outlet to just ramble and upload photos of my style and my life. I then knew blogging was the right avenue for me and I haven't looked back since! I couldnâ&#x20AC;&#x2122;t help but notice youâ&#x20AC;&#x2122;re also an extremely talented illustrator! What is it about illustrating that you are most drawn to? This is quite a hard question really because there are so many aspects I am drawn to or 'love'. However I have to say that illustrating has always been a passion of mine, back in the day in year 5&6 my best friend and I used to play a 'mums and dads' game, which we used to go home and draw our characters and what was going to happen to them. I can't even remember when I started drawing because I must have been holding a pencil when I was born haha.. but in all seriousness I am drawn to growing and always achieving a new style and look. I am drawn to pretty visuals and creating dreamy feminine ladies, all of which I like to get lost in and pretend my life is just as sweet. It is also how I let off steam, I just love that. Youâ&#x20AC;&#x2122;ve been a bit of a busy bee lately putting together your new publication, Buttercup. It looks beautiful! Please tell us about it: Buttercup is a fan zine I have been working on, to share a feeling of childhood nostalgia with those with the same enthusiasm. If you are creative, a bit of a day dreamer or simply love looking through pretty pages of photography and drawings then that's what it is all about! I wanted to put in subtle touches of nostalgia that trigger otherâ&#x20AC;&#x2122;s own thoughts and memories. I also added some stickers for a bit of fun! You can go buy a copy now over on my Etsy! Eco Bird Online Store “Here at Eco Bird we live, breathe, love sustainable and ethical style” – Eco Bird Eco Bird is an online store with a big heart. It features talented and ecoconscious designers from Australia and New Zealand. Visit http://ecobird.net to view the entire range. Now, here Abby was, pulling on her coat to hide the ice-skating penguins on her well-worn flannels. Sitting on the side of her bed, she pulled on her knee-high boots, and then stood in front of the full-length mirror. Not an ice-skating penguin in sight. Her Nanna would be proud. It was mid-morning, yet still quiet as people lay sleeping their Sunday away. No need for urgency; “Sunday Spent” she liked to call it. Abby opened her front door, brandishing an umbrella on one arm, her bag on the other, and was greeted by a tiny mountain of discoloured leaves left for her by the wind. Stepping over it, she noticed these little parcels at most people’s doors, along footpaths and street corners; the colours of the deadened leaves dull beside the arresting brightness of discarded chocolate wrappers and other bits of rubbish. The greying sky grew heavier, having the appearance of hanging closer to the rooftops. Clouds sat motionless; sedentary with weight, their bellies bloated with threatening rain. Abby rushed along the near empty street and turned into High street, her mind set on the mission at hand. Today was “Sunday Spent” and with it came the need for a few necessities. On arrival at the Supermarket, Abby searched the aisles for the ingredients to her Maple Syrup dumplings. In the baking section, she cursed her tiny stature as she reached for the self-raising flour, too high above her head. Nearby, a young stock boy came to her assistance. As they both reached up, him with little difficulty, he glimpsed an ice-skating penguin escape from the cuff of her coat. Awkwardly, she thanked him and with the expected apathy of a teenager, the boy shrugged his shoulders and went back to work. Abby entered her apartment and stripped off her coat, fully exposing ice-skating penguins. Placing the ingredients on the table, she set to work. Dumplings lowered delicately and left to simmer in sauce, she kicked off her boots, entered her bedroom and pulled back the bedcovers. “Juan Jose Cruz Martinez was born and raised in Spain. He finished his Master of Design in Sydney and currently lives in Melbourne, Australia. His work has featured in music, trend, lifestyle and fashion publications in Europe, Australia and the US, and he is always ready to undertake new challenges.” -juanjosecruzphotography.com When did you first begin photographing musicians? It started by chance. Since I was in high school I have always been very interested in the music culture, listening to a lot of bands that no one else was listening to until years after. Four years ago I had a random night and I ended up chatting about this kind of music with a tour manager who gave me a ticket to see Peaches and I just happened to have my camera with me. I took some photos and they came out really well so I decided that I will do that for a while. What is it about music photography that you love the most? The bands and the energy. Photography allows me to be involved with the music scene doing something that I like. Then I use my blog ‘Liveinphotos’ to get people closer to music, also through interviews, gig recommendations and Friday listens. â&#x20AC;&#x153;21 years old photographer from Vilnius, Lithuania, now living and studying photography in London. I always liked to escape into other worlds through books, movies and music, but I found out that the best way to do that is by taking pictures. My photography is a way to capture moments and make them magical, bring the dreams into this world." -- ailerastone.com When did you first discover your passion for photography? When I was about 15 and I signed up for deviantArt. There were so many young talented photographers that I got inspired to try to do something myself. Has there been one moment in particular that really stands out to you as your biggest or most favourite achievement so far? Can't really think of anything in particular, nothing big really happened yet, but it's always great to get my work into magazines. I always wondered about the times when we were both so cold But now I realise it's just a part of our story to be told Cold like the Antarctic, where the penguins pair Cold like the way they huddle, keeping warm in the frigid air The commitment to each other they so lovingly share The body heat to the freezing dive they continuously compare The cold is just the warmth in reverse The penguins stuck in a wordless verse So instead they yell with an individual call Finding each other, so the chills can fall And the touching limbs once previously torn To hold one another above freezing ice Because their love made what was frozen, merely lukewarm. Sitting in her room, drunk on vodka in a cold winters solstice, she spoke in subliminal messages. Leah Reena Goren is the owner, maker and designer of the Etsy store Leah Goren. The Brooklyn-based illustrator and surface pattern designer creates and sells textiles and garments containing her own beautiful patterns and artworks. The designer may have only graduated from Parsons School of Design in 2012, but already her Etsy store has taken the world by storm. With over 14,400 admirers and 1,570 sales to date, Leah Goren’s Etsy shop is certainly one to add to your ‘favourites’ list. Do you have a special connection with the landscapes you photograph? The landscapes I photograph usually are places I have inhabited or travelled to that are new and foreign to me. I am drawn to these new landscapes as I want to capture the adventure of going to a new location and experiencing something for the first time. Within the photography series I completed in Finland, I had never experienced snow before, so I was enthralled with how the snow would blanket the whole entire landscape. I went to Finland for a two-month residency to Arteles in Hameenkyro, which is located in Western Finland. So I interacted and became personally attached to these landscapes, and how the snow would blanket the landscape which would make all the landscapes indistinguishable, and that is what inspired the photography series. Who inspires your creativity the most? Robert Smithson and Richard Avedon have been the two main inspirations of my artistic practice. While I was in Finland, I read Patti Smith's book Just Kids, about her relationship with Robert Mapplethorpe. It was a really great read, and inspired me to get into sound art and photography again. Describe a day in the life of Laura Batch? I wake up, usually with my pug dog Louis. By the time I wake up Louis will be staring at me, because he is hungry. So I get up and fed him then take him for a walk to the park, or to a local cafe in South Yarra to meet friends. Then, if I'm lucky, go to Pilates, or lunch with my sister before heading off to work at the Parkview Hotel. Submissions now open for the Spring 2013 issue! Are you a photographer, artist, creative writer, shop owner, fashion designer, blogger or band and you feel as though your work fits the whimsical and nostalgic aesthetic of Whim? Then email whim.online@gmail.com, because we would love to hear from you, either to feature on the website, or in the upcoming Spring issue. “We are Paris and London, creative twins living in Belgium. More precisely our made world. Of course we all invite you to join! We both share the same interest, dreams, ideas...And of course we adore fantasy, creating our mad world, and fashion makes it possible! Besides fashion we adore art! Art history, drawing, painting, museums…” – The Mad Twins Blog When and why did you both begin the blog, The Mad Twins? We both started blogging 2 years ago, and I think it was because my sister and I wanted to show things we were interested in. Not only fashion, but also art, stories and events. How would you best describe your fashion style? Our personal style describes our personality. We're dreamers and our style reflects our dreamy side. Most of the time you see us in light clothes or colorful outfits. We still are a little child inside that wants to be a princess or a little fairy in the forest. I also would describe our style as romantic since we're real romanticists. Everything that looks cozy, romantic and cute will get my attention. We love to bring nature in our outfits and that’s why we go to the forest to take pictures. London makes many flower headbands as well. Nature is something that is beautiful, but it can be cruel as well! The changes of the season, the rain, snow. Maybe we want to create a nature outfit? It’s hard to describe your own style. It is just reflecting who we are. One day we are in a very dreamy mood, the other day in another mood. We're wearing what fits our mood best. What has been the biggest achievement of The Mad Twins blog so far? We don't blog to achieve things, but we think our biggest achievement was meeting other bloggers. Exchanging mails with other bloggers from around the world, knowing their interests and learning from each other. There has opened a whole new world as a blogger, with new challenges and people to meet. Being part of the bloggers world and deciding to be part of it, we guess, is our biggest achievement. Describe a normal day in the lives of London and Paris? That would of course depend if it [is a] weekend or not. The weekdays are normal and perhaps 'boring'. Sorry to disappoint you guys, we would love to tell you something exciting that could happen in school like in the Harry Potter movies or in series like The Vampire Diaries but, the week is just a normal ritual with school duties. In the weekend it depends. We of course have to work for school, but we can go shopping with each other and friends. Go to parties, picnic, events, perhaps even a city trip. Reading a good book in the sun and we can't forget the tea parties or just drinking tea, since we really are tea-addicted. We almost forgot to tell that we of course work on the blog during our free time as well. What advice do you have for aspiring fashion bloggers? Having fun is most important. See blogging as a hobby and something you love doing, everything else that comes with it is a plus point. Blogging is an opportunity to get new ideas and besides that you are able to meet other bloggers. We donâ&#x20AC;&#x2122;t think fashion has rules. You just have to wear what you like. Yetis may be relatively new to the music scene, but they certainly have been receiving a lot of praise and attention of late, writes Jack Clarke. Based in Sydney and Nowra in Australia, the band consists of members David Muratore, Cameron Smith, Curtis Smith, Jenna Smith, and recent newcomers Ellis Birkby and Rhys Stamnas. Playing a fun mix of folk and indie pop, Yetis released their first EP ‘Lightmares’ in March 2011. Their second EP ‘Hear me Now’ was released in November 2012. One of the highlights of their new EP is the track ‘Winter Blues’, a song the band says “was all about emerging from wreckage with a renewed desire to get back to the things you love doing and the people you love being with”. Whim was lucky enough to interview band member Curtis and to have him shed some light on what has quickly become one of our most favourite bands. When did the band Yetis form? We formed in January 2011. If you could sum up the band in just three words, what would they be? Really fun sings. 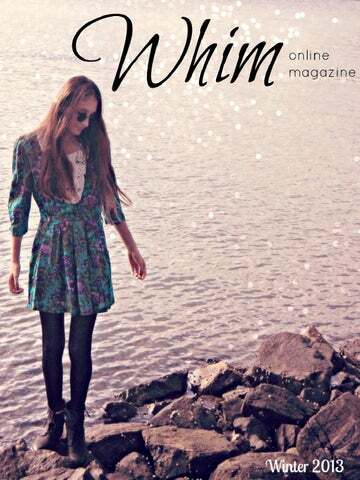 As this is the Winter issue of Whim, we couldn't help but notice the song 'Winter Blues' on 'Hear Me Now', with the beautiful and intriguing lyrics "In a winter full of flannelette and dreams overgrown". What thoughts and emotions does the word 'winter' conjure up for you? The context of the song was one of relief. The situation is one where you are unhappy, and getting yourself out of this leaves you feeling pretty swell about having time to yourself to justâ&#x20AC;Ś hang out. Winter is commonly characterised as kinda melancholy, and this could have been true for this situation too. But in this context, winter was all about emerging from wreckage with a renewed desire to get back to the things you love doing and the people you love being with. last song we invited Patrick and the band on stage as well as the beautiful duo, ‘Achoo, Bless You!’ who opened the night to help us sing a tune of ours called ‘Oh, the Joy!’. Not only once did we join forces on the stage. At the end of Patrick’s set he invited Yetis and Achoo! up to sing the lovely song of his, ‘Carry On’. So many voices and harmonies! Most favourite moments indeed. What's next for Yetis? We are ourselves working that out. Possibly some live acoustic recordings, might go into the studio again, video clip? One of the above, as well as some shows coming up in Sydney and Wollongong. We are getting to know more and more brilliant local acts; we would love to do a split EP with someone that we love. And, more shows! Be sure to see the band play this winter as they bring their unique sound to fans in shows across Sydney and the south coast. If you wish to see an outstanding live performance and experience the musical talent of Yetis with your own eyes and ears, you can do so by attending their show with Belle & the Bone People at FBi Social on the 4th of June. A story by Mike Scott I can’t remember the date; I can barely even remember the year. I was having a dream at the time, the kind where you wake up and feel like you’re in love, and for some reason that stuck with me. More so it was drilled into my mind that you put an end to it, shaking me from my slumber with what I initially thought were undecipherable ramblings echoing into my room from outside. My mind tells my body to ignore you – to fall back asleep, and to wake up with only wonder, but my mind is also curious, and it’s this incessant curiosity that sees me standing at my window squinting out across the street. You are naked; standing on the roof of your house which sits directly across from mine as you berate what most would consider to be the innocent night sky. You claim to be in on its secret - that you know it’s hiding stars from you, and that you’re not one to be fooled so easily; aggressively accosting them to show themselves, proclaiming that nothing ever comes from spending a life hiding amongst the shadows. You curse, you swear, your bare buttocks acting as a signal to your severity. In the morning when I look again across the street, I realise that your previous night’s rant was more than likely birthed after alcohol conceived its way into your mind as opposed to under the wing of true belief and genuine opinion, as you lay passed out in the same place that you previously stood shouting. I pack with me, along with my schoolbag, a bacon and egg sandwich and a flask of orange juice to offer as a cordial pick-me-up. By the time I get to your house, you’d risen, and sat with your legs dangling over the side of your roof as if your house were a couch. I could see that you were deeply trying to process how you got to where you were; battling internally with what your next move shall be. Puzzled, you accept the sandwich and juice, but instruct me to leave them sitting on top of the hedges that grew beneath where your feet dangled, insisting that you’ll get to it sooner or later. When I arrive home from school I’m satisfied to know that you eventually did, the evidence of this being the now drastically mangled hedge that caved and crumpled underneath the weight of your desperately flailing and plunging body. That was my first memory of you, and the beginning of a friendship whose memories have lasted me a lifetime. I was to find out that we were one and of the same. I looked up to you. You gave me often twisted, ironic, yet somehow unarguable pieces of advice, such as “the cure to loneliness is self indulgence, and there’s nothing more self indulgent than a drug habit,” even though you were too brave to ever put such theory into practice. You lived like a shark, always moving in one direction or the other. When I found out that you had done it, I ran from school, not stopping even when it felt as if the pavement was beating its way through my body into my temples. Your house was fully consumed by flames by the time I arrived. I could feel the heat kissing me on the cheek as I stood on the sidewalk. I saw you walking off into the distance; taking one step towards your new life after another, and I wanted to chase you down to say goodbye and to wish you luck, but I knew that you would evaporate into the distance quicker than I could catch up. You too knew this though, and a box of matches marked “For when your day comes” left on my doorstep acted as my final adieux. When my day comes! When my day comes, to pick up and start again, I’ll know where to begin because of you my sharklike friend. Tina Sosna is a talented photographer based in Germany. Her beautiful photography has been featured in publications such as oh comely, APRICOT Magazine and Lost Freedom. What, or who, inspires you the most? Films, music and books inspire me a lot, but also nature and feelings. What feelings and emotions do you like to portray through your photographic work? Sensitiveness, loneliness, sadness, love and things I feel in my dreams.